For field reservations, please contact Diane Gorski at (904) 209-0346 or dgorski@sjcfl.us. Tuesday and Thursday Evenings – 6:00 p.m. to 9:00 p.m.
For more information, please call Jayne Delany at (904) 209-0329, jdelany@sjcfl.us, or visit the St. Augustine Pickleball league’s Facebook page. Treaty Park is a 47 acre complex that is home to the Triple Crown Fall National Championships, Paws Dog Park and Robert Laryn Skate Park. 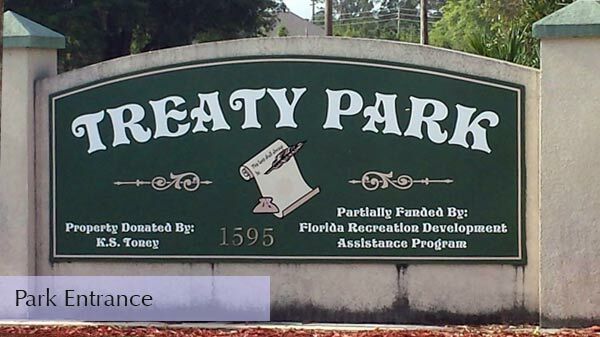 Treaty Park offers active and passive recreation amenities to citizens of all ages. For the softball enthusiast, 4 lighted 300’ softball fields and adult leagues are available for all levels of play. Two multi-purpose fields are available for soccer; kite flying, ultimate Frisbee, pick-up flag football games or any other activity that requires an open field. For the “court” enthusiast, there are 6 lighted tennis courts, 8 lighted paddle tennis courts, 8 pickleball courts, 4 racquetball courts, 2 bocce ball courts and 2 lighted basketball courts. A bicycle path, short of 7/8 of a mile, and jogging/walking trail surrounds the park. A handicap-accessible playground, horseshoe courts, picnic pavilion, charcoal grills, picnic tables and benches encompass a 3-acre lake with nature trails and a canoe trail. The lake also features a fishing pier; it is a catch and release only (no cast nets permitted) lake. If interested in renting the Treaty Park pavilion, please call Joanne Machula at 209-0328 or email her at jmachula@sjcfl.us. For more information about Pavilion rentals, visit the Pavilions page. With 28,000 square feet of concrete, there is plenty of room for skateboarders of all ages and abilities. We have ½ pipes, rails, ledges, banks and a 9 and half foot (6 foot shallow end) kidney shaped pool to challenge even the most experienced skater. The “Little Dudes Park” is for beginning skaters and those under the age of 12 to hone their skills. The concession stand / pro shop is filled with knowledgeable skaters who will help you with all your skating needs and a snack bar. Robert Laryn Skate Park webpage. Treaty Park hosts numerous leagues. Check out our Adult Activities page to learn more. NCAA Division I and junior college fast pitch softball tournament held in February. St. Augustine Fall National youth baseball tournaments held Fridays-Sundays in October. Contact: Willie Cooper at wcooper@sjcfl.us.